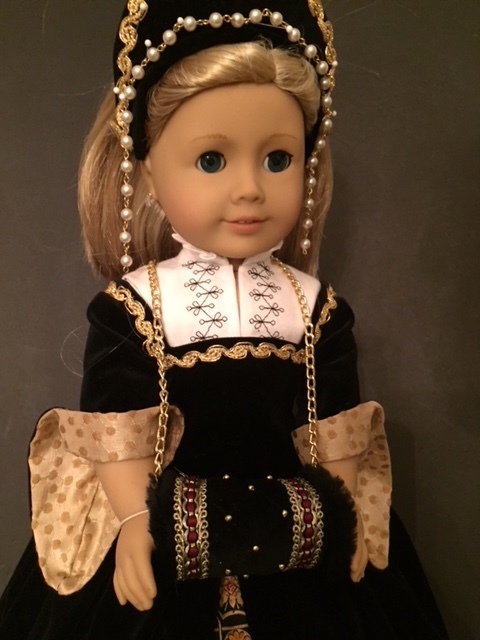 This Reversible Tudor Partlet pattern from ReadCreations has so many options. There are 5 neck options to choose from, 2 types of closures and an option to make the partlet from fabric or lace. Add the partlet as a cover to the Medieval or Viking dress patterns, also available from ReadCreations. A wonderful completer pattern to Read Creations "Tudor Dress" pattern. 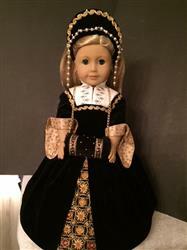 Both the partlet and the **** were easy sew items, but they really make an elegant addition to an already beautiful Tudor gown pattern. I did blackwork on the partlet bodice with a pleated collar. For the ****, I reversed the inside and outside pieces so that the fur lining wrapped around the velvet outer fabric. 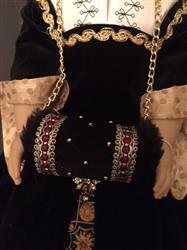 Though I hate hand-stitching, don't you think this **** is spectacular with the braid and beading on the velvet! Here are photos of the partlet, the partlet with the ****, and the whole costume (Dress is a separate pattern).